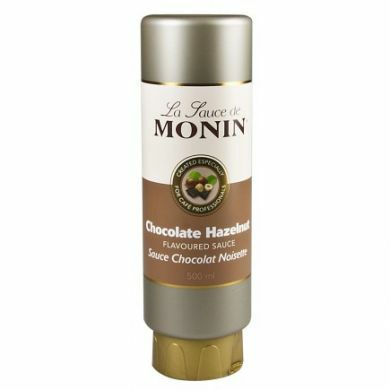 Squeeze bottle of smooth and delicious chocolate with roasted hazelnut. An easy-to-spread sauce perfect for speciality coffees, toppings, decorations but also in cocktails. Its intense chocolate taste combined with a full body hazelnut twist will be perfect to create mouthwatering applications. Taste: Nose of buttery cocoa and roasted hazelnut. Rich and balanced taste of cocoa and slightly roasted hazelnut. Length of time in mouth: Hazelnut long lasting mouth feeling. Colour: Brown with golden glints. Applications: Mochas, lattes, cappuccinos, milkshakes, dessert drinks, toppings. 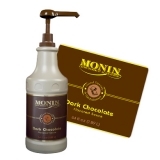 Monin Chocolate Hazelnut sauce is perfect to turn any of your applications into a gourmet treat. Find your inspiration from its use in confectionery and patisserie to your tantalising drink versions. Do not forget also to combine it with fruit flavours such as red fruits like raspberry and strawberry. Glucose syrup, sweetened condensed skimmed milk, sugar, water, dark chocolate, (cocoa mass, sugar, cocoa butter, emulsifying agent: soya lecithin, natural vanilla flavouring) (9.5%), hazelnut paste (9.5%), modified starch: E1442, flavourings, salt, acidifying agent: tartaric acid (L(+)-), preservative agent: potassium sorbate. Store in a cool dry place below 25C. Consume within 6 weeks of opening. Drizzle on dishes or add to drinks as required.